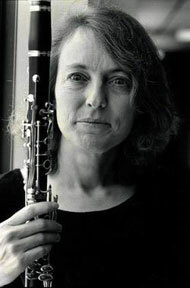 Margot Leverett is one of the foremost clarinetists of the klezmer revival. Classically trained at Indiana University, she was involved in avant-garde music when she first heard klezmer, the dynamic East European music traditionally played at Jewish weddings. Leverett was a founding member of the Klezmatics in 1985 before moving on to establish a solo career with her first CD, "The Art of Klezmer Clarinet," a tribute to classic klezmer of the 20's and 30's. Her current project, "Margot Leverett and the Klezmer Mountain Boys" is an all-star band combining the best of bluegrass and klezmer. Their self-titled CD, released to rave reviews in 2002, was choreographed by the Paul Taylor Dance Company in a new work entitled "Klezmerbluegrass". Their latest release "Second Avenue Square Dance" features guest artists Jorma Kaukonen and Hazel Dickens and is available now from Traditional Crossroads. Margot Leverett was a staff instructor at KlezKamp for over 10 years and has also taught at KlezKanada, Klezkamp West, Klezmerquerque, and at colleges, music festivals, and Jewish organizations across the country and Europe.